Deb has over 30 years of experience working in community economic development as both a faculty member and practitioner. 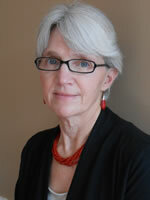 She is Senior Vice President of LOCUS Impact Investing, VCC’s new social enterprise. She co-founded the Center for Rural Entrepreneurship in 2001 and participates as a member of the Center’s Entrepreneurial Communities’ and Community Development Philanthropy teams. Together with the Aspen Institute Community Strategies Group, she is working to advance the practice of economic development philanthropy among place-focused foundations. Deb has BS and MS degrees in Agricultural Economics from Cornell University and a PhD in Agricultural Economics from Virginia Tech. To get all the latest updates on LOCUS, be sure to sign up for our newsletter and other LOCUS emails and connect with us on social media.